Sometimes a girl just wants a "sweet" read. Something that's gentle and uncomplicated and has my cynical heart melting into a puddle like a Hershey bar on a hot summer day. 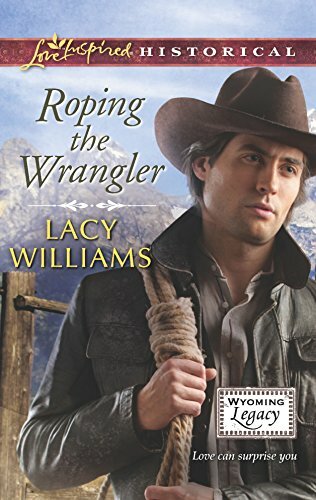 Roping The Wrangler by Lacy Williams fits the bill nicely. Here we have a nice story, about nice people, who need to overcome their personal fears to get to their happy-ever-after. This story is a tie-in to an earlier Williams release, The Homesteader's Sweetheart. For those readers familiar with that earlier story, the hero and heroine had a whole passel of adopted children. The hero in Roping The Wrangler, Oscar White, is one of those children, now all grown up. He's making his living as a horse trainer and has earned himself a bit of a reputation. The latest town he's rolling into is practically buzzing about his arrival, including the children, which is making the schoolmarm's job a little trying at the moment. Sarah Hansen actually grew up with Oscar in neighboring Bear Creek, Wyoming - and all she remembers about him is that he teased her mercilessly, even calling her shrew in front of all their schoolmates. Oscar is in town for one last job. With the money he's going to get from Paul Allen (who also happens to be head of the school board and Sarah's overbearing boss), he plans to buy a quality stud horse and head back to his small patch of land near his folks' place. Naturally the good intentions fly out the window when he sees Sarah again. He remembers her as a bossy sort, but he finds himself captivated by the schoolmarm who everybody in town knows is trying to land a husband. What ends up bringing these two together? Kidlets, of course. Three sisters, two of them Sarah's students, who are in dire straights, and for reasons that escape Sarah and Oscar, the "good townspeople" refuse to step in and help. Williams is one of Harlequin's inspirational writers who could easily be publishing with secular Harlequin Historical. Her religious themes tend to be extremely subtle, and this book in particular would be hard to distinguish as an inspirational if it didn't have the Love Inspired banner splashed along the top. Here the author tackles fear. How fear can overrun you life, how it can hold you back, how it can keep you from living. Both Oscar and Sarah need to overcome their fears, to step outside their respective boxes, and discover that a life worth living is a life spent taking a few risks. The three young girls who enter into their orbit are handled well. At first Sarah thinks that the town turns their nose up at them because their dead father was an Indian. After their mother passes, they are left in the care of a stepfather who spends his day at the bottom of a whiskey bottle. Sarah desperately wants to help, but has a tendency to muck it all up (so nice to read a heroine who isn't Mary Poppins!). Oscar remembers what it was like to be unwanted, unloved, an orphan that nobody gave a damn about until Jonas White took him in - so he starts working behind the scenes to help those girls - for their sake, for his and for Sarah's. Where this story stumbles a bit for me is with the ending, when the villain is dispatched with. I liked the revelation, but it's the sort that would carry some serious fallout for the people in the villains' life. I found the fact that they were left swinging in the breeze a little unsettling, but it certainly opens up some intriguing possibilities for later installments in this series, should the author want to revisit some of these characters. I think she easily could - and heck, maybe even redeem a few of them. This was a quick, sweet read that had a nice, uplifting message without beating me over the head. For readers who like cozy historical western romances, Williams has written another good one.